Local community awareness from Ballarat with love. Inspired by what the generous Ballarat community is trying to help the homeless and non-homeless who are struggling to live in the western world. I tried to read and research helpful links that I could find online. I do hope it may help someone to find free foods around Ballarat, nearby towns and the locations that the links will direct you to forage food, fruits for free and stuff. Most likely the homeless are shy to ask for help and so from what we heard and read in our local community real story news, Ballarat alone is currently discussing on "Halving Homelessness - Think Tank Ballarat" and come up with a solution for the homeless with 28 team proposals on the platter. For the non-homeless and wanting to live by foraging in the urban areas, there are options we can find online and where to find them. This way of life encourages individual foragers not to hunt the whole thing so you can come back or share with other like-minded. Not everyone can forage food especially the mushrooms in Australia due to lack of education and awareness what are edible out there. I grew up from a remote colder mountain area in the Philippines, and I was indeed blessed to forage with my brother when we were young during mushroom seasons. We knew what to pick climbing the mountain especially after fire season and rainy season had begun among the Pinetrees. It was one of the most exciting unforgettable foraging experience of my life! Coming to Australia is not easy if you did not grow up locally in the area you live unless you learn the local mushrooms. Around Australia alone, some families, young people and struggling individuals are making it tough to live in the rat race neither alone thinking the developing countries that cannot get economic welfare from the government. Sometimes, we need to pause and ponder that those in the developing countries can survive without government handouts because of family-oriented instincts. My point posting this article is sharing the hope how a community alone can shine to any individual out there doing it tough when we can. How a community can address these issues by coming up with great ideas and be able to implement them effectively and efficiently. For now, I just want to share the following websites you can click and follow where those maps are directing you to forage foods in Australia. 1. FOOD IS FREE LANEWAY BALLARAT - Yes, there is FREE FOOD, seeds and seedlings in BALLARAT. You can connect them on Facebook and get updates or find it at the corner of Ripon St and Warrior Place in Ballarat. It is a program sharing food with the local community, beautifying the landscape by sharing seeds from your home garden and encouraging community spirit. 2. RIPE NEAR ME - this site has been shared on social media for a while now. 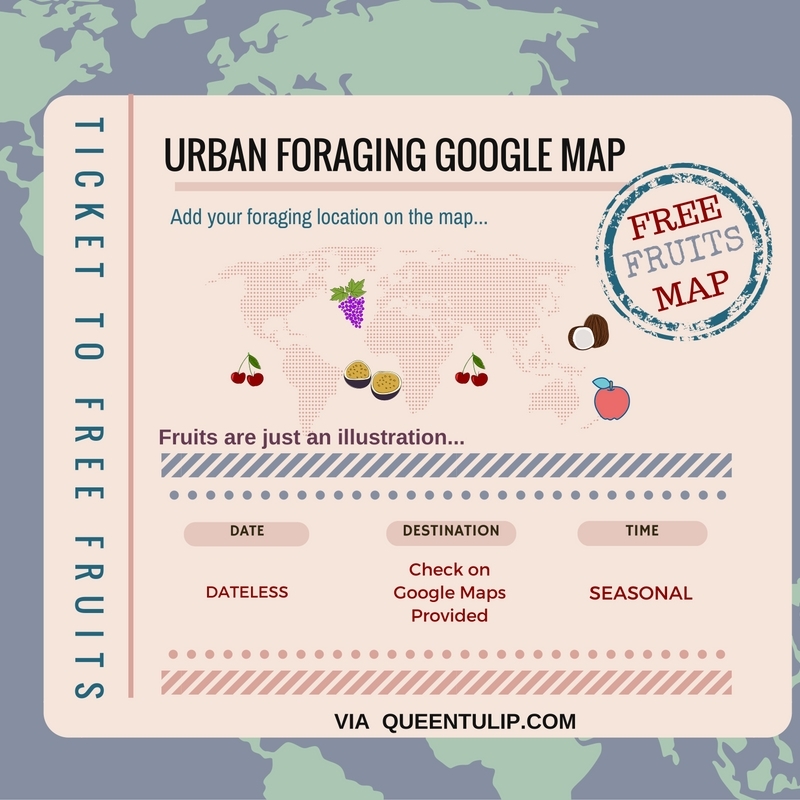 It is a local map guide around the world by locating your place and see if you can find someone who likes to exchange your fruits, plants, or chicken eggs, etc. Some can be free, pay less than what you can buy from the supermarket. You can add your home gardening ripened fruits and share them too. 4. DUMPSTER DIVING - After watching "The Moaning of Life" documentary presented by Karl Pilkington I am prompted to share how other people who are homeless can live happier than those who are paying their mortgages year after year. I was culture shocked in the western world when my first time to see Dumpster Diving residing in Australia live-streaming on Periscope in 2015. They are jubilant to share what Australians and the rest of the western world are wasting in the large bins that are still yet edible and useable! According to Freegan.info "Dumpster Diving is legal in the USA except where prohibited by local regulation." Some other countries including Australia are strictly illegal to Dumpster Diving due to health risks and safety regulations. Other countries like the UK are solving this problem by creating a "Bargain Brand Food Outlet" for the "best before a date or after date" instead of wasting it. 5. BREEZEWAY MEALS PROGRAM BALLARAT by Uniting Care - "BreezeWay provides a substantial, hot nutritional two-course midday meal every day of the year for people who are marginalised, homeless, living in insecure accommodation and have no cooking facilities. It operates from 10.30am to 1.00pm each day and services approximately 60 meals daily or over 1,700 meals per month. Takeaway meals are also provided which include sandwiches and fruit outside the lunchtime meal. A cafe style environment is also a place of shelter during the winter months." 6. SOUP BUS BALLARAT - "The SoupBus provides an after-dark meal service to Ballarat’s homeless and less fortunate through the cooperation and support of the Ballarat community. SoupBus aims to create dignified and respectful interaction with those in the community who are in need of the greatest assistance. Five evenings a week (Sunday 5.30pm-7.30pm & Monday to Thursday 7.30pm-9.30pm), one of the supporting restaurants, cafes and bakeries assist in the food preparation for the SoupBus to distribute free of charge from our central location." 7. MEALS ON WHEELS - More than just a meal, a government program by Australian states. "AMOWA is a federated body of state and territory Meals on Wheels Associations." 8. POP UP SHOP FOR THE HOMELESS AND THOSE IN NEED - run by two young females, collecting donations in Ballarat and giving things away for free. 9. GUMTREE AUSTRALIA - An online shop for buying and selling goods or freebies within your reach. Similar to eBay except Gumtree users can give free stuff away instead of going to a land filled. You can quickly type your location and search what you are looking for. 10. BALLARAT COMMUNITY FOOD ACTIVITIES - The Monash University students thoroughly helped to record all the list together, and the database can be found on the Australian Government website or from the link provided. It leads you to "How to access affordable fresh and healthy food, including where to get food parcels or free and affordable meals for those in need in Ballarat." If I missed something, please feel free to share in the comment below. Meals On Wheels Hosts Food Truck Rally In NE Mpls.